More than twenty years of experience, with contributions to many open source projects over two decades in addition to a wide variety of commercial experience. I am currently editing the Technical Specification for the Low Level File I/O library for C++ (https://wg21.link/P1031) and I maintain its reference implementation https://ned14.github.io/afio/. I have proposed what may become the implementation mechanism for C++ deterministic exceptions, the new standard error object (https://wg21.link/P1028) and the new calling convention for all C speaking languages (https://wg21.link/P1095). After six years of work, I successfully got a fundamentals library past Boost C++ Libraries peer review and into Boost, the first fundamentals library to do so in many years https://ned14.github.io/outcome/. I hold graduate or postgraduate qualifications in Software Engineering, Economics, Management, Business Information Systems, Educational and Social Research, and Pure Maths. I formerly served in administration of the Boost C++ Libraries. I was the lead for spending over $150k of funding. I have spoken as a domain expert on multiple occasions at the major global C++ conferences, CppCon, ACCU, C++ Now, Meeting C++ as well as at local C++ user groups. I have been interviewed twice as a C++ expert on CppCast. (Non-contract employment only) Sponsorship of my ISO standards work. To recruiters: if both of the above are not an option, I am NOT INTERESTED in your role. Please do NOT contact me. The Waterloo Institute for Complexity and Innovation (WICI) facilitates transdisciplinary and collaborative research promoting innovation and resilience within - and beneficial transformation of - the complex adaptive systems at the core of human well being in the 21st century. Establish the University of Waterloo as a world leader in efforts to use complex-systems ideas to promote innovation to solve multi-scale, systems-level global problems. Within the University of Waterloo, WICI acts as a “centre of centres” for research on complex systems. Within southern Ontario, WICI activities bring together scholars, practitioners, and policy makers working on both theoretical and applied complex systems problems. Beyond the immediate geographic scope of Southern Ontario, WICI uses online and interactive technologies to disseminate its findings and to engage vigorously with complexity researchers around the world. Advising on social networking, teleconferencing, other assorted odds and ends. Managing the LinkedIn, Facebook et al social networking front ends for the WEA. We specialise in the general optimisation of systems supplying advice on and solutions involving the use of technology to improve business efficiency. We supply everyone from businesses local to Cork as well as large multinational corporations which span the globe. Helping the Public Key Infrastructure group modernise their twenty five year old C++ codebase of approx. two million lines of code. • To petition and cajole some of the top minds in C++ to mentor a student for three months, as well as to write up descriptions of a set of suitable student work items from which students may pick. • To review the technical content of proposed student work items for suitability, particularly to encourage mentors to break up work items into smaller, more tightly defined chunks and to add additional clarifying documentation where necessary. • To encourage and remind the Boost community to do peer review on student submissions as part of the candidate ranking process. • To lead out matching up potential mentors with potential students where a project proposal lacks a predefined mentor. • To assist answering questions about the GSoC process from both students and mentors. • To be the primary liaison between Google and the Boost community, including the Boost steering committee, delegating work to others where appropriate. • To arbitrate between students and mentors when disagreements occur, and to review student work independently as part of reporting to the Boost steering committee on progress and goals achieved. Performed one month of feasibility testing on QuantHouse's main ultra low latency market data supply product FeedOS, producing a report on their future options for reducing latency and increasing density of clients served. Peer reviewed the submissions to the C++ Now conference held annually in April in Aspen. This was a 100% remote working contract with a 100% remote working team each member distributed from the US to Continental Europe. Tooling applied per-commit, nightly and weekly by the Jenkins continuous integration service. 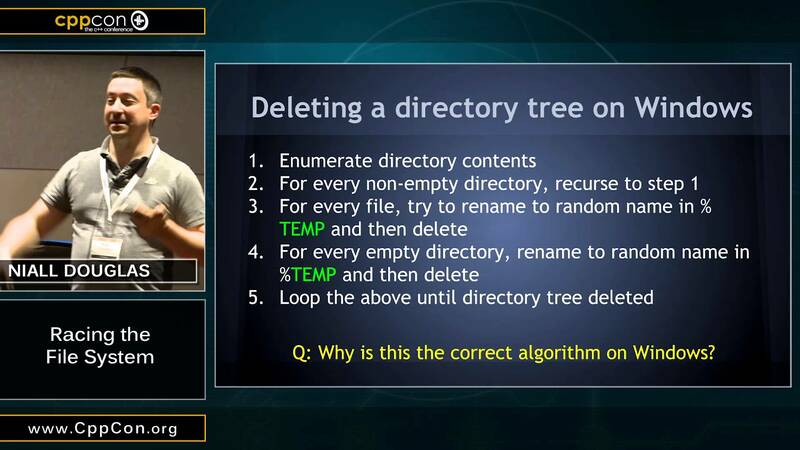 Amongst the many tools applied were automatic style enforcement via a mixture of clang-format and python tooling, linting via clang-tidy on both POSIX and Windows, a full sweep of address, memory, thread, undefined behaviour sanitisers, weekly runs of Dr. Memory for symbolic memory debugging, performance regression testing, line and edge unit test coverage monitoring. Build was almost entirely rearchitected and reimplemented by me to use state of the art cmake 3 design patterns and single header build enabling a very large reduction in build system maintenance overheads for the team given all the supported platforms. I utilised a "build driver" functional cmake design allowing the team's product to integrate well with multiple externally imposed build systems, thus making all parts build within the wider organisation happy. Multiple low latency and worst execution time techniques were implemented by me such as enforcing fast-math, disabling C++ exceptions and resurrecting a performance regression test suite. One particular low latency feature item I designed and wrote was an extremely low latency audio scheduler for Windows 7 which is used by the product's Unreal Engine integration to implement spatialised audio for all UE4 games using the native audio system. Some of these techniques will hopefully enter the C++ standard via my participation on WG21 SG14. Most of the Android and ARM (32 and 64) port was done by me with almost all the groundwork done for an iOS port. To port the optimised SIMD routines from AVX/SSE2 intrinsics to ARM, I made use of the excellent Intel SPMD compiler based on LLVM (https://ispc.github.io/) to rewrite the SIMD routines into the ISPC language, and had Python use the ISPC compiler to generate optimised SIMD assembler for Intel x86 and x64, and ARM with NEON2. This allowed very easy tuning for very specific hardware targets simply by changing the ISPC compiler's setting. Peer reviewed the submissions to the CppCon conference held annually in September in Seattle. I shall be contributing over the coming months to Boost (and therefore proposing for the C++ 17 language standard) a superior std::promise/std::future implementation based on proposed std::expected and a permit object. This superior implementation should be orders of magnitude faster than the current C++ 11/14 reference implementation, partially due to being based on hardware memory transactions (with an Intel TSX based implementation initially). To consult and assist on a replacement implementation of the MaidSafe platform written in the Rust programming language. To consult and assist on any systems programming matters which may arise during the contract, which may or may not include the interaction between platform dependencies written in other programming languages such as C or C++. To consult and assist with improved unit testing of the software, specifically improved automation of distributed machine unit testing e.g. a single functional test being performed over a dozen machines each of which is networked behind a NAT being controlled by some unit test master controller. To advise on the technical capabilities of potential new staff or contractors being interviewed. To advise on matters of Business, Management, Information Systems, Economics and Complexity Science and Education, or in any other expert topics in which ned Productions Limited staff hold formal qualifications, and are therefore in a position to advise from authority. 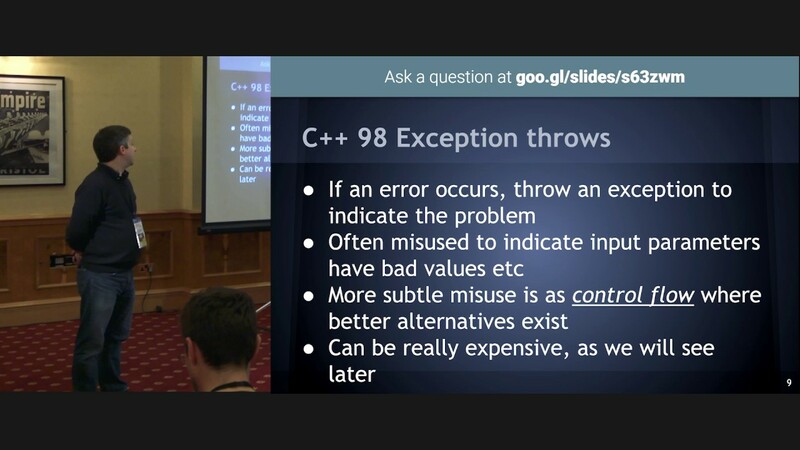 C++ Now is one of the world's leading C++ conferences where experts present to experts. Presented for 90 minutes on a C preprocessor driven modularisation and dependency injection technique made possible by C++ 11. As part of my C++ Now 2015 conference presentation, published a handbook of best practices in C++ 11/14 libraries. Peer reviewed the submissions to the C++ Now conference held annually in May in Aspen, Colorado. To deliver a replacement RUDP implementation semantically compatible with the existing RUDP implementation, but without most of the power consumption, scalability, thread safety and UDP congestion control issues of the present implementation. a. The replacement RUDP implementation shall aim to meet the Boost C++ Library admission guidelines described at http://www.boost.org/development/requirements.html, except where the proper practice of C++ 11/14 diverges. b. The design of the replacement RUDP implementation shall take account of the feedback from the extensive stakeholder survey which was performed at the end of Agreement no 1. Stakeholders surveyed were MaidSafe staff, Boost members currently contracted by MaidSafe, the Boost community and the Boost.ASIO community. Records have been kept of all feedback and shall be reviewed again prior to commencement of the replacement implementation. Improve stability of RUDP and Routing layers, specifically: a. Systematically investigate the causes of reliability problems in the RUDP and Routing parts of the Maidsafe software platform. b. Effect changes to the implementation to mitigate such reliability problems. Investigate the problem of UDP packet congestion control, and to substantially improve on the present implementation. C++ Now is one of the world's leading C++ conferences held annually in May in Aspen, Colorado. Sessions last 90 minutes. Selected as mentor for two Google Summer of Code 2013 projects in the highly esteemed peer reviewed Boost C++ Libraries. The first project, proposed Boost.AFIO, is a linear scalable, batch, chainable, asynchronous closure execution engine extending Boost.ASIO and Boost.Thread specialised as a portable asynchronous file i/o implementation library with the student, Paul Kirth, porting an existing pure C++ 11 codebase written and designed by me to Boost and the last three generations of the compilers GCC 4.6, 4.7 and 4.8, Microsoft Visual Studio 2010, 2012 and 2013, and clang/LLVM 3.1, 3.2 and 3.3 on the operating systems Linux, FreeBSD 10 and Microsoft Windows. Proposed Boost.AFIO is an alternative solution to Google's WG21 N3731 (Executors and schedulers v2) proposal, or indeed Microsoft's WG21 N3721 (Improvements to std::future and Related APIs), and it is hoped that AFIO will be the pattern chosen instead for ISO standardisation. Despite being less than 1000 active LOC, the effort involved in readying this library for peer review has been substantial, and included the configuration of our own custom Jenkins CI running a series of snapshotting VMs and a very extensive automated unit and functional test suite, which runs inside my own personal cloud compute mash up platform based on the Proxmox VE virtualisation solution with three nodes in France, Quebec and in my own home. AFIO now exceeds 20,000 lines of text, most of which is extensive testing and documentation. You may find the official Boost documentation on proposed Boost.AFIO of interest (https://ci.nedprod.com/view/All/job/Boost.AFIO%20Build%20Documentation/Boost.AFIO_Documentation). The second project, Boost.Trie, implements a STL trie (prefix tree) container for C++. I was selected as one of three mentors for this project due to my domain experience with the popular nedtries open source bitwise tries algorithm library (http://www.nedprod.com/programs/portable/nedtries/). The component objectivisation of the C++ application binary interface using the advanced capabilities of the clang compiler to extend the C++-1y Modules proposal (WG21 N3347) with an additional layer of information abstraction in order to very substantially reduce the coupling between software components, and therefore inhibit constant breakages of source code trunk due to it being a never ending moving target. It is well known that Microsoft's COM, a much simpler implementation though similar in spirit, is regarded by Microsoft as one of their greatest internal productivity enhancement technologies ever developed. This generated a 12,000 line working prototype which I proposed via an internal 10,000 word white paper for ISO C++ standardisation, perhaps initially as part of the Boost C++ libraries. The employment of the open source memory analysis tool valgrind as part of platform and application performance and hardware prototype simulation, and automated testing and regression. I added a significant improvement to the callgrind tool, adding the ability to estimate CPU time from the call tree using empirical timings which came in within 20% of reality on the Qualcomm Snapdragon S4 Pro CPU (note that this CPU has non-linear execution dynamics) and 10% of reality on Intel x86/x64 CPUs. The generation, analysis and manipulation of large (hundreds of thousands of vertices) graphs of live semantic information about the hardware and software making up BB10, most specifically the call tree for a Cascades EmailCard process launch output by my improvements to the callgrind tool, and for which I wrote a custom callgrind to time weighted GraphML directed graph format parser using Boost.Spirit. Visualising usefully the incredible complexity of modern C++ call tree graphs was a good workout of my Econometrics training. I led out, implemented and finished a port of the clang/LLVM compiler stack plus compiler-rt runtime to QNX and BB10. Watching LLVM generated from some of the five million lines of BB10 C++ system libraries I had ported to clang be JITed into ARM on device was quite neat. My need for a clang/LLVM port was an idea for a clang AST based C++ library API review automation tool which would have replaced a majority of the manual human effort expended on internal API review. I initiated and participated in a series of summer meetings between Gary Klassen and Sean Simmons with the University of Waterloo with a view to creating much closer relations between BlackBerry and their technology startup spin out programme. This was facilitated by me being an Affiliate Researcher with the UW Research Institute for Complexity and Innovation (WICI). A side project of mine was a regular series of internal white papers using Econometrics to empirically compare BB10 major releases with the competing mobile device platforms Android 4.2 and Microsoft Windows Phone 8, along with desktop operating systems for good measure. Some of the statistical approaches I took were information entropy analysis, Zipf's Law identification of statistical outliers, and Lempel-Ziv-Markov chain analysis of duplicated assets in private memory. Appointed to the National Standards Authority of Ireland (NSAI) ISO/IEC JTC1/SC22 (Programming languages, their environments and system software interfaces) and JTC1/SC38 (Distributed application platforms and services) mirror committees. Appointed Irish convenor of JTC1/SC22. Joined Austin Common Standards Revision Group responsible for development of POSIX. Luxubrations Οξυδέρκεα (Luxubrations Oxydérkeia) was a startup project aimed at bringing deep, penetrating insight (oxyderkis) to academic studies performed under artificial light (luxubrations). Originally intended as a Master of Research thesis project with the Institute of Education in the University of London, this software performed real-time cloud and client analysis of how students went about writing academic work outputs. Unfortunately due to the loss of access to students with which to test the software, it had to be abandoned after six months of development. Gave sixty hours of lectures in Business and Management to undergraduate students from l’Ecole Supérieure de Commerce IDRAC Lyon, France as part of their semester abroad studying in a native English speaking country. Topics taught were: (i) International Business (ii) International Law (iii) Advertising, Marketing, Banking, Finance (iv) The European Union. Each of these was delivered via a critical approach making particular use of annotated contemporary articles from the business press and audio-visual techniques to overcome the lack of native English barrier to comprehension. A particularly interesting component of the curriculum delivered during this course was a component of critical thinking Business skills based on Springer, C.W. and Borthick, A.F., (2004), 'Business Simulation to Stage Critical Thinking in Introductory Accounting: Rationale, Design, and Implementation', Issues in Accounting Education, vol. 19 no. 3, pp. 277-303. During action research performed during the teaching of the course, I determined that the students would prefer a more practical business task solving approach to their group work activities. On searching the literature, I found the above paper which presents a seven-stage assignment plan from which I derived a very similar plan. We facilitate the enabling of growth via the publication of materials, holding of conferences and the establishment of dialogue between those in a position to initiate change. For our final group project, my team won the prestigious 2009 Student Enterprise Awards held annually by Enterprise Ireland, the Irish Government organisation for entrepreneurship, for our Web 2.0 FIXatdl Financial Algorithmic Trading Definition Language Editor. Gave twenty-one hours of Economics lectures for the Adult Education Department in their interdisciplinary Social Studies degree programme, during which I achieved an excellent 87.2% class attendance, an 82.8% Interestingness and an 81.2% Clearness rating in the weekly feedback form evaluations. Designed the syllabus of the course to dovetail in with the other modules taught in the Degree. Coursework consisted of five readings from five topical books with a series of questions which were marked each week. Topics covered include non-linear chaotic dynamic systems, information asymmetries, energy return on investment (EROI), volatility and periodicity in economic growth, the disequilibrium structures within demand and supply, the sources of the Celtic Tiger, the Gaussian distribution and the central limit theorem, correlation and convertibility of energy, food and water. This was a double major in Economics and Management and therefore had no programming content. I did perform Econometrics (the statistical study of economic behaviour) and my Masters dissertation topic was on "Modelling the Costs of Climate Change and its Costs of Mitigation". My third and fourth attempts at reimplementing computer software structure from the ground-up, with the primary goal of creating a 10x or greater productivity improvement for skilled workers (Brookes’ Silver Bullet). Implemented in C++ & Python using TnFOX (previously Qt) and multithreading throughout, it is designed for 64 bit NUMA architectures and can run on Win32/64, POSIX Unix (e.g. Linux, FreeBSD) and Mac OS X but with low resource requirements for eventual transition to mobile phones. To make software self-organising and self-optimising based upon system (ecosystem) and complexity theory (c.f. Bateson, Heisenburg, Prigogine) whereby tools magnify the effectiveness of effort. To conceptualise all programming and user operation in simple cognitive elements, thus greatly improving intuitiveness of operation and much increased productivity. To integrate all software components across multiple systems such that they appear and act as one. To be fully secure at all levels whilst remaining compatible with the host OS – this is a full capability based system. Designed a multithreaded distributed application for Windows 2000 using the Microsoft technologies Visual C++, VisualBasic, VBA, MFC and C#; MySQL & ODBC for the database and the National Instruments’ technologies PXI, LabWindows/CVI, TestStand and LabView. Also designed and implemented a system restore CD-ROM which was a bootable version of Linux with custom-written software. The project’s goal was to be a bench-portable test bench control and component management software plus bench-customisations for the (i) M-3011 Hydraulic Test Bench Bench (contracted by EADS Deutschland) and (ii) B-1057 Fuel Component Test Bench (contracted by British Aerospace Systems) for the EuroFighter project. A self-adapting help system which taught the user as they used the bench. This was written in HTML with custom embedded ActiveX controls (MS HTMLHelp). A graphical virtual instrument showing fuel flows, valve positions etc. which were manipulable using the mouse. This was implemented using a custom designed scripting language to specify possible fuel flows and possible valve states. A searchable library of all engineering specifications in multiple formats including SGML, PDF and MS Word. A completely customisable UUT test report generator (using Crystal Reports) which each air force could tailor individually. The application could run on two computers connected by TCP/IP at the same time controlling the same bench. Performance analysis at the end of project using tools designed by myself showed 5000 i/o's per second sustained (well above specification). Other responsibilities I assumed there included liasing extensively with EADS, BAE and directly with the militaries of the four EuroFighter participating nations. My final project for this degree was a technically superior Hardware Abstraction Layer (HAL) called NedHAL for generic ARM architectures in ARM assembler and ANSI C. It was an object orientated modular framework with multiprocessor capability. Also ported the uC/OS II RTOS onto my project (now freeware). Some of this code has been since incorporated into the primary car operating system firmware Micrium which is used by many major car manufacturers. This three month contract was to implement a specified list of items, most important of which was to improve performance. This was especially successful with a threefold performance increase and a six figure cost saving thanks to not having to prematurely upgrade hardware. Replaced the real-time operating system (RTOS) in their GPS (Global Positioning System) library for their embedded ARM device with a licensed third-party RTOS called SuperTask! (made by US Software). Implemented and integrated many new features including Flash ROM reprogramming, serial port driver, LCD panel display driver, power saving and Infra-Red communications. Merged ARM's Demon debugger into the new operating system, allowing debugging without a JTAG and ICE (In-Circuit Emulator) based debugger. Summer Job performing a number of "odd jobs" involving the writing of several small computer programs in C and ARM Assembler. Wrote a driver for ARM’s Angel debugger to drive a tertiary serial port on the Cirrus Logic CLPS-7111 board. Due to hardware difficulties, successfully used a logic analyser to implement the code. Wrote a modular EEPROM programmer in C++ for Win32 allowing test ROM images to be easily flashed into test boards. Overhauled and redesigned DEC's StrongARM uHAL for generic Arm's and ported the new uHAL to the Arm test motherboard, the PID7T. Also ported the redesigned uHAL to the Cirrus Logic CL-7111 board. Won the prestigious 2009 Student Enterprise Awards held annually by Enterprise Ireland, the Irish Government organisation for entrepreneurship, for our Web 2.0 FIXatdl Financial Algorithmic Trading Definition Language Editor group project. Final project: Designed and implemented a technically superior Hardware Abstraction Layer (HAL) called NedHAL for generic ARM architectures in ARM assembler and ANSI C. It was an object orientated modular framework with multiprocessor capability. Also ported the uC/OS II RTOS onto my project (now freeware). Some of this code has been since incorporated into the primary car operating system firmware Micrium which is used by many major car manufacturers. How to load all modules in a folder? Is there any movement towards specifying interaction of C++ exceptions and pthread cancellation? What do the numbers in the "Total" line of git gc/git repack output mean? Can I add Microdata from HTML5 to a XHTML Strict site and still be compliant? what the author of nedtries means by "in-place"? 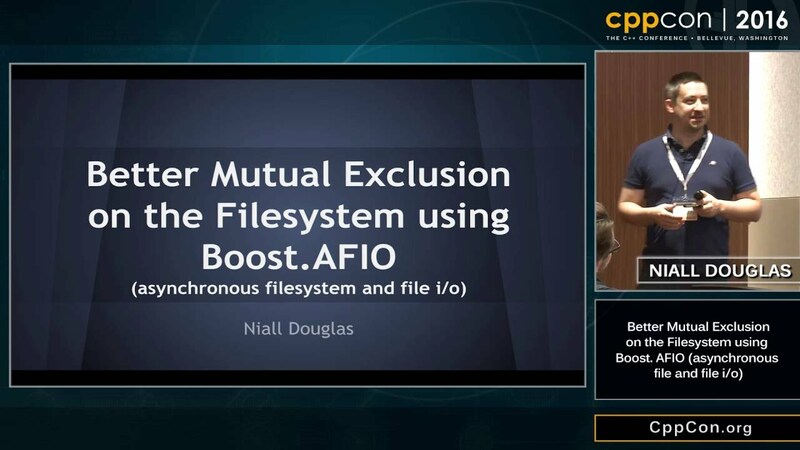 CppCon 2016: Niall Douglas “Better mutual exclusion on the filesystem using Boost.AFIO"
CppCon 2015: Niall Douglas “Racing The File System"
User Mode Memory Page Allocation: A Silver Bullet For Memory Allocation? Submitted a library intended for C++ standardisation which implements fixed latency failure handling as a predictable latency alternative to C++ exception throws. As a vocabulary type expected to enter standardisation, this review attracted enormous interest from across the C++ ecosystem. It was rejected, but with plenty of feedback on what to design for v2 Outcome. After a two and a half year wait, my proposed asynchronous filesystem and file i/o library for C++, Boost.AFIO was reviewed by the Boost community. It received a unanimous but one rejection with very extensive feedback on what needed to be changed. The work on a complete rearchitecture and rewrite based on that feedback began in October 2015, and the first part of that rewrite should become ready for peer review in Q1 2017 as well as being presented by me at the major C++ conferences throughout 2017. Jan 2001 → May 2002 EuroFighter Test Bench Control Software Architect – Setroson S.A. Written 61 answers. Active in c++, boost, file-io, posix, c and 3 other tags.